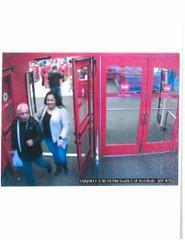 NAPD looking to identify these two individuals involved in credit card thefts. The two individuals are suspects in the theft of credit cards from Panera Bread in North Andover. The cards were used at the Target Store in Salem NH shortly after the thefts. Anyone with information is urged to contact NAPD.